In just a few short days, fans will be reunited with Dominic Torreto (Vin Diesel), Luke Hobbs (Dwayne Johnson) and the rest of their favorite characters when The Fate of the Furious hits theaters, which will mark the start of the franchise's final trilogy. The last installment, Furious 7, may have been one of the most tumultuous productions in recent memory, with the cast and crew having to deal with the sudden death of Paul Walker, who passed away over the Thanksgiving holiday weekend in 2013, during a fatal car accident. While the movie ended up proving to be a critical and a commercial success, along with providing a fitting farewell for Paul Walker and his beloved character Brian O'Connor, the movie was almost entirely cancelled after this untimely death. 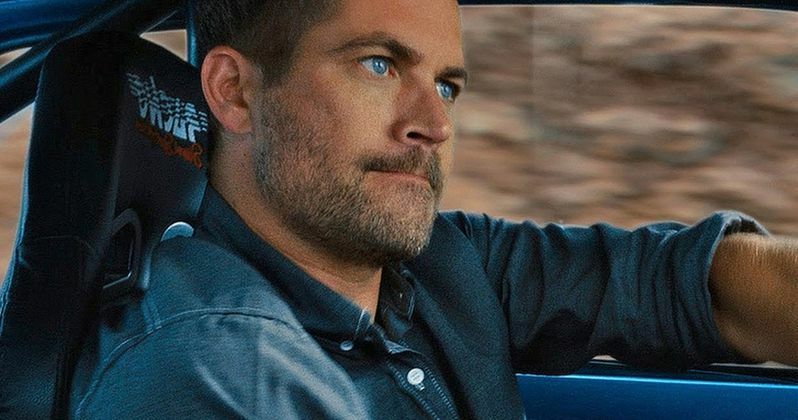 The cast and crew of Furious 7 had all broke for the Thanksgiving holiday weekend, with production slated to resume the following Monday, when we learned on Sunday, November 30, that Paul Walker passed away at the age of 40, due to a tragic car crash in Valencia, California. The actor had been attending an event for his charity Reach Out Worldwide, and he was a passenger in his friend Roger Rodas' Porsche Carrera GT, which lost control and crashed into a light pole while travelling at speeds upwards of 100 miles per hour, killing both men. While promoting The Fate of the Furious on The Bill Simmons Podcast, Neal Moritz spoke about his dear friend Paul Walker, and how they had planned on cancelling the movie until Universal asked them to take some time and think about it. "I can't watch the movie anymore, because I know that if I watch it right now, I would cry. Paul was the greatest guy I've ever met. He was a real guy's guy. Girls loved him. Guys loved him. He was so full of life, a surfer, outdoorsman, more than an actor, even though he was really good at what he did. He was just the greatest guy in the world. Honestly, when that happened, when his passing happened, when that accident happened, we were like, 'We're not gonna finish the movie.' We'd done over half the movie. We were like 'We can't finish the movie. We just can't do it.' And Universal said take some time. Think about it. See what you guys want to do. We didn't know what to do. We didn't know what we could do or what we should do." Bill Simmons asked if the producer had gotten input from the cast. Neal Moritz added that he did meet with the cast several times, including at Paul Walker's funeral. The studio shut down production indefinitely in early December 2013, with the studio announcing in late February 2014 that filming would resume in April 2014. It was also revealed that the production planned on "retiring" Paul Walker's Brian O'Connor character, instead of killing him off, with a heartwarming goodbye to Brian O'Connor where he races Dom one last time, before the road splits and both characters go their separate ways. Neal Moritz revealed that they knew they could continue making the movie once writer Chris Morgan came up with that ending, while discussing the beloved song "See You Again" by Charlie Puth and Wiz Khalifa that accompanied the ending, which the producer believes should have won the Academy Award for Best Original Song. "It wasn't until Chris Morgan came up with the idea at the end of the road splitting that we knew we had a way, a path to the end of this movie. Then we had to work our way backwards and figure out with the footage we already had existing and with the special effects things we were able to do, how we could make that story work. That scene, in combination with that song, it was perfect. That song was written for the movie. We have these songwriting camps, where we show songwriters the movie, or particular scenes, and we showed them this scene, and said, 'Here's what we're looking for." I remember when I heard that first melody that Charlie Puth wrote, we knew we had something incredible. There was talk about, 'Is Charlie Puth going to be the artist? Or are we going to replace him with someone else?' I was so glad that we went with his soulful version, with Wiz Khalifa on top, and I just think it's the perfect combination of music and film. People ask me if we're ever disappointed that we're not honored with awards, and I say the only award that I ever thought we got bypassed for, that we should have really got, was at the Academy Awards, that song wasn't nominated, and should have won. There was no song more fitting to a movie, to the emotion or the picture, than that song, in the history of cinema, as far as I'm concerned." There have been rumors that Paul Walker's Brian O'Connor may in fact return in either The Fate of the Furious or the last two movies in the franchise. Paul Walker's brothers Caleb and Cody Walker were used as stand-ins for their late brother when production resumed on Furious 7, with Caleb Walker revealing last year that he had a conversation with Vin Diesel about bringing the character back, but it was never confirmed if that will happen or not. Since fans were given such a heartfelt farewell to the character in Furious 7, it remains to be seen whether or not the studio would consider bringing him back with a combination of CGI technology and the late actor's brothers being used as stand-ins.